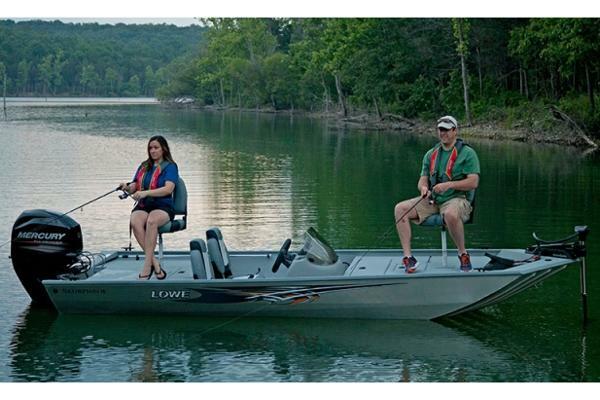 2015 Lowe Skorpion This boat model may or may not be in-stock. Please contact your local, authorized dealer for more information The durable, no-nonsense Lowe Skorpion is a well-built, well-equipped mod-V fishing boat at a terrific price. Premium standard components and loads of fish-working space keep you on top of your game and within your budget. Features include: All-aluminum constructionExtruded gunnels and formed-in keels (6)16 oz. charcoal marine carpetSwitch panel w/ 12V receptacleBow & stern storage compartmentsBilge pump & aerator pumpBow & stern navigation lightsMotorGuide® 45# 12V trolling motorLowrance® Elite-3x fishfinder23-gallon bow aerated livewell w/ baitwellDriver and passenger seats plus 2 pedestal fishing seats w/ basesPort rod holders w/ organizer for 4 rodsAvailable painted or galvanized bunk trailer Lowe factory packaged boats are available with various horsepower Mercury® outboards. Standard equipment and options may vary from model to model.